Some may recall visiting the Brandywine Battle Field during the 2014 Reunion in Pennsylvania or my post about the Revolutionary war service of Thomas Babb (1-2-1-1) who fought in the battle. As we approach the 240th Anniversary of that fateful day in American history Fold 3 has assembled a revealing article about the event and I wanted to pass that on to you. They say a picture is worth a 1,000 words, but in this case it speaks volumes. I put this picture together for my LinkedIn page and thought I’d share it with everyone. Volume 14 & 15 round out the FINAL installments of the trees outlined by Ian Henry Babb and are on sale now via Create Space and will be available in the next few hours on Amazon.com. Links are provided below for more information. With the addition of these volumes, the English Babb lineages (Vol 8-15) now span over 1800 pages, which is on top of the 2000 pages in the original series (Vol 1-8). There is always more work to do, but I’ll be taking a breather and attending t o a few other matters in my life that have been neglected while writing this series. In this volume, we explore 11 lineages found throughout the counties of Staffordshire & West Midlands. The lines in this volume are NOT yet associated with the 7 known Y-DNA lineages previous covered. I will cover them in the numerical order first established by Ian Henry Babb. In this volume, we explore the remaining lineages throughout England (excluding those in Somerset, Devon, Staffordshire & West Midlands which are already covered in Volumes 9-14). The lines in this volume are NOT yet associated with the 7 known Y-DNA lineages previously covered. If you would like to purchase 4 or more copies of any combination of volumes, you can do that directly through me and receive a 50% discount off the cover price (+ shipping). Please contact me directly and let me know your shipping address and the numbers of the volumes you wish to purchase. Shipping is cheap in the US and UK. I’ll have to place the order myself, so bear with me. I’ll also get you an estimate of the shipping and can accept checks or PayPal. Once we agree on the exact price you can issue payment as you are ready. Volume 13 of the Babb Unabridged Series is now available! This installment is all about the many fold lines of Babbs in Devonshire. The book is available for sale using these links to Create Space and via Amazon . In this volume we begin to explore the lineages that are NOT yet associated with the 7 known Y-DNA lineages covered in my first 12 volumes. Devonshire (often referred to simply as Devon) hosts 3 of those 7 known DNA lineages and contains 30 other fragmented lines containing about 1000 individuals. If you are a Male Babb descendant of anyone in this book, please contact me so that I can work with you to find the connection and place you in the proper genetic tree. All of the lines covered in this volume have their roots traced back into Devonshire. I will cover them in the numerical order first established by Ian Henry Babb. There is what appears to be one more volume coming and its a monster! Stay tuned! It’s come to my attention that some joker is out there on Amazon trying to resell the first volume in this series for over $1200. While I’m glad they think it is so valuable, don’t be suckered in. The entire series is printed on-demand as people order them. So, there is never a need to purchase a copy on the secondary market. It should never be “out-of-print”. Also, I’ll sign your copy for free when I see you next. For a wide variety of reasons, we may never know exactly to which lineage of Babbs this important family connects. The earliest records of the first 140 years of Doddiscombsleigh were already perished “irrecoverably” as far back as 1842. Most other records it mentions were lost in a blitz of Exeter in 1942. Through lack of a male heir, the family seems to have given way to the Ducke family and then to Thomas Roach, who sold the Estate in 1769. Because of the vast devastation of the records we have a very limited view of this family and had to reconstruct primarily through secondary accounts such as the Rev. George Oliver’s “Ecclesiastical Antiquities in Devon” written in 1842. He points out the lack of early evidence, even at that time. Unfortunately, the copies of wills he mentions were later destroyed prior to having been copied. Oliver’s account sheds much light on this family, but lacks in certain ways. Ignoble, (ig-noh-buh l): 1. of low character, aims, etc. ; mean; base, 2. of low grade or quality; inferior. 3. not noble; of humble descent or rank. This sounds rather short and vague at first, but is the essential info that is needed to reconstruct the crest. Let’s look at each word individually. Gules, (fr. gueules): the heraldic name of the tincture red. The term is probably derived from the Arabic gule, a red rose, just as the azure was derived from a word in the same language, signifying a blue stone. The word was, not doubt, introduced by the Crusaders. Heralds have, however, guessed it to be derived from the Latin gula, which in old French is found as gueule, i.e. the “red throat of an animal.” Others, again, have tried to find the origin in the Hebrew word gulade, which signifies red cloth. Gules is denoted in engravings by numerous perpendicular lines. Bend, (fr. bande): the bend dexter is perhaps one of the most frequently used of Ordinaries, q.v., being a straight piece extending from the dexter corner to the opposite edge of the shield. It is said to derive its origin from the belt, baudrick or baldrick(Baltheus, Cingulum militare), which was once a mark of knighthood; other heralds, however, have seen in it the idea of a scaling-ladder. According to Legh and other heraldic writers, the bend should occupy one-third of the field when charged, and one-fifth when plain. In English arms the bend is always placed straight athwart the shield, and never bowed as in foreign arms: at the same time, in some late MSS. it is fancifully drawn with a curve, in order to represent the convexity of the shield. A bend is very frequently subjected to a modification of its margin, and is engrailed, invected, indented, embattled, counter-embattled, bretessed, raguly, champaine(or warriated), nebuly, wavy; also bevilled, cotticed and fimbriated, all of which terms will be found explained. Or, (fr. from Latin aurum): the chief of the tinctures, i.e. gold. Engravers represent it by an indefinite number of small points. The term Gold is frequently used by heralds to avoid repetition, and the French word Jaune, i.e. yellow, is met with in old heraldic poetry. Shoveller. The Male Shoveler (formerly Shoveller) is characterized by a dark green head, yellow eyes and a bill that appears longer than the head itself, thus resembling a shovel. As this is a very patriarchal society, the ducks pictured were most likely Males. See Ducks. Ducks, (fr. 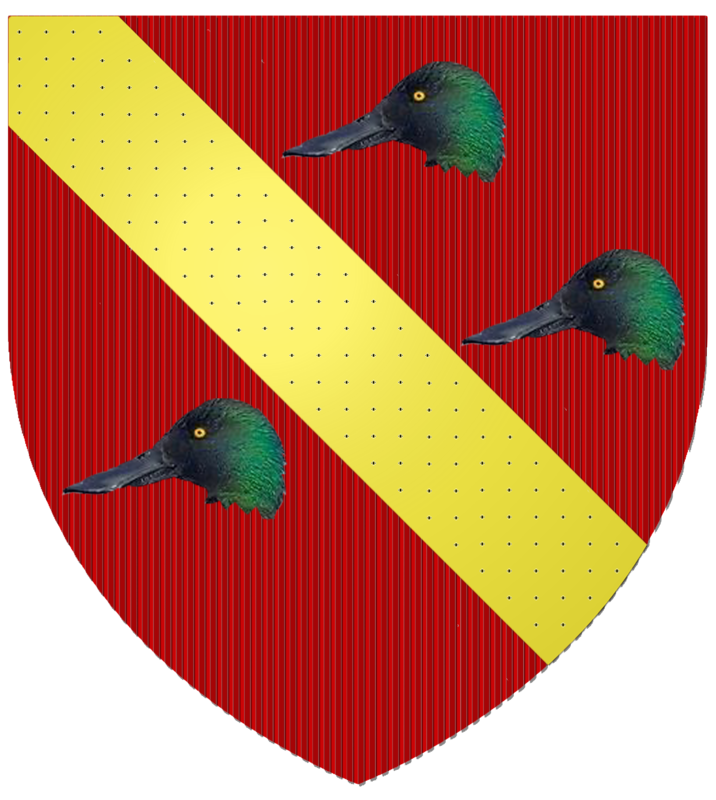 canard): We find this very large family (anatinœ) represented in heraldry under several names. The duck proper, as also the drake. The shield-drake, or sheldrake, as it is written (anas tadorna). The wild-duck (anas boschas), with the teal (anas crecea) and the mallard. What is meant by the sea-teal is not certain. The sholarde, or shoveller (anas clypeata) may be distinguished by two small tufts of feathers, one on the back of the head, another on the breast. Erased, eraced, or erazed(fr. arraché): violently torn off, leaving a jagged edge. Then term is chiefly applied to the heads and limbs of animals. When applied to birds’ legs the expression à-la-quise, i.e. à la cuisse, is often added to signify that the upper part of the leg is shewn. A head erased close signifies that it is torn off without any part of the neck remaining attached to it. Pulling this all back together we have a Red ridged background with a Gold diagonal stripe running approximately 1/5th of the size of the entire shield from the top right shoulder of the bearer to the bottom left hip (this is always described from the point of the view of the person holding it, not from the perspective of the person viewing it). The Gold is dotted throughout. Three Male Shoveler Duck heads without a neck and a tattered end adorn the Red ridged background on either side of the gold stripe. The heads are Dark Green and two small tufts of feathers, one on the back of the head, another on the breast. This is offset by the gold eye on each of the duck heads. The only remaining question is which side had two ducks and which side had 1. The text does not tell us, but we will continue to look for examples and adjust as more information becomes available. The family is known to us as Devon Pedigree 32 and is not currently connected to a particular Y-DNA proven lineage. Given the lack of male heirs, we are unable to tell at this time to which lineage they properly belong. There was at least one example of the crest that survived into modern times in the form of a bowl, but the exact location of the bowl is not currently known. It is believed to be in the US. A picture of the bowl exists but has not yet been located as of this writing. This information will be contained in the next volume of the Babb Unabridged Series. If you have information regarding this crest, please contact the Babb Family Association or myself. Daniel Greig Babb (written 15 Jun 2017).